My friend Rick Marshalls suggested I publish Robin’s great USS Monitor trip report on ThinkingDiver. I was all too happy to oblige. As I waited for my luggage I began to realize that all around me were people from the military. I came from a navy town in San Diego, but this was different. As I glanced around at the other passengers arriving and began noticing their local counter-parts it soon became apparent that this is a real military town. Then it dawned on me, not only was Norfolk an important base of operations for our country?s service men and women, but this was also the birthplace and backbone of our nation?s naval defense. I arrived in Norfolk, VA at 11:00 pm, the first portion of my journey to join a team of divers whose destination was the USS Monitor. I was meeting Mel Clark, Curt McNamee and Judd Dunlap at the hotel. The plan was to get a good night?s sleep and drive to Hatteras, NC the next morning. We rented an F-150 crew cab truck, loaded it with all our gear and barely had a place to sit. If this truck veered off the road, it would cost more to replace the gear than the house it crashed into! We had three Digital SLR?s with UW housings, dual strobes, one HD video camera with UW lights, four closed-circuit rebreathers, four laptops; oh yea, lots and lots of other dive gear. Looking at the map, Hatteras did not seem far away by car. As a matter of fact, many of the locals told us it only takes an hour and a half to two hours to get there. Four hours later we arrived and were greeted by Rick Marshall, diving legend Mike deCamp and his lovely wife Wesley. Rick informed us that there was a group out diving that had been there the prior week and needed time to shower and get their things together before we moved into the house. So, what do divers do when not diving? We talked about diving, then started to put our gear together and formulate plans for the week. A few hours later we joined the rest of the team for dinner at our second rented house. As we arrived Joe Dobarro and Tom ?Motz? Grothues, both from Rutgers University, were preparing the REMUS 100, an autonomous underwater vehicle (AUV). The REMUS 100 is very impressive torpedo shaped AUV, slightly less than two meters long, nineteen centimeters in diameter, and can dive to one hundred meters. We were excited to hear Joe and Tom explain its new mission to map the Monitor in 3D, as well as collect other scientific data from the wreck site. As we gathered for dinner I realized we really had a great team of people, each offering their own unique skills to help us achieve our goals. Our first objective was to secure a mooring to the wreck, then assist REMUS in its mission, and finally take as many useful videos and still images as possible showing the current state of the wreck during our dives. If that was accomplished then we were to see if any voracious lionfish had made their way up the Gulf Stream to the Monitor, and document the quantity and location on the wreck site. After dinner that first night we were advised of the following days plan. Dan Crowell and Bob Ryan were tie-in team one. Their job was to find the existing mooring line and shoot the end of the line to the surface with a 250lb lift bag. Rick and I were on tie-in team two. We would either be finishing the job, or inspecting the tie-in points to make sure they were strong enough to handle the weight of our charter boat and the divers. 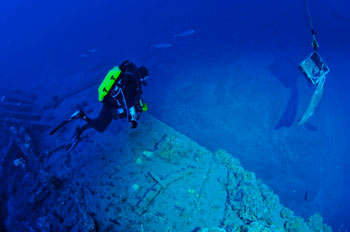 The remaining divers would go to a local wreck to do a warm-up dive to make sure that their gear was ready to go for a deep dive to 240 fsw, with strong current likely. Dan would also lead a production team in generating daily ?inews reports? that would be posted on the Monitor National Marine Sanctuaries web site titled ?Graveyard of the Atlantic Expedition 2009.? Every dive trip has some type of drama, this one was no exception. Right after our first team meeting, Rick received a phone call from his wife, Romi. The adoption that he and Romi have been working towards for the past ten months was happening immediately and had to be on a plane headed to Alabama the next morning. The timing of this was unbelievable and bittersweet! 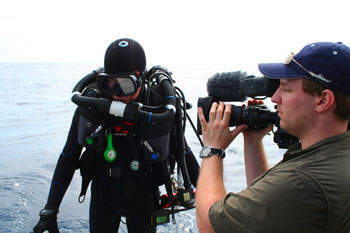 Rick began to pack his dive and video gear, make travel plans and delegate duties in order for the expedition to move forward in his absence. Sunday at 6 am, Day One: Everyone was awake anxiously anticipating that first dive and what the Atlantic had in store for us. As I went upstairs to get my morning caffeine (ice cold diet coke) and breakfast bars, a few grumblings were heard about not everyone getting to dive the Monitor today. This passed as we realized one anonymous diver left several diet cokes in the freezer from the previous day. Frozen cans of soda eventually explode, an unexpected mess for our perpetrator to clean up. Needless to say, he took some kind ribbing from his peers that morning. As I arrived at the ?OC Diver,? Captain Ted Green was assisting the REMUS crew to load the AUV and secure it to the boat for a rough-water journey. The rest of us loaded all of our gear on-board, including two large production quality SONY XD Cam cameras, two Amphibico Z7 underwater video systems, still cameras and lots of tackle to bring the REMUS back onto the boat. The clear blue sky was misleading; as we pushed through the channel we could see the force of the colliding currents and why this area is known as the ?Graveyard of the Atlantic.? It was a two-hour boat ride out to the wreck site of the USS Monitor. Or at least to what we thought was the wreck site. 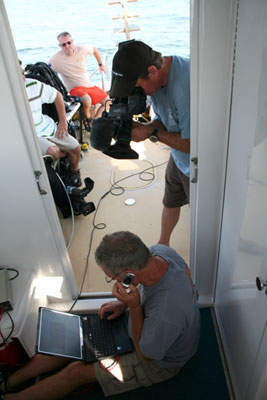 We used the GPS coordinates given to us, only to find nothing but fish and sand, not even a bump on the depth finder! After ?mowing the lawn? for another hour, Ted and Dan?s Atlantic wreck diving experience paid off and we found the wreck. The weather still looked good but the current was cooking. After Ted was assured he had the right hit for the wreck we went up current and drifted back in order to measure the speed of the current and to time how quickly we would be over the wreck. Captain Ted made the decision that if we were to dive that day, it would have to be immediately and we would have to be sand darts in order to hit the wreck. We donned our gear; pre-breathed our rebreathers and got ready to dive. Ted put the boat into position and we stood on the stern, waiting for the command to go. As the boat got near the target Ted yelled ?dive, dive, dive!? The three of us jumped in perfect syncopation and began our decent as quickly as possible. I descended with my hand on my diluent add button kicking down as fast as I could. When we finally reached the bottom we could see the starboard side of the wreck faintly in the distance. As we swam closer we realized that we were very close to the armor-belt that the Navy divers had previously cut off in order to remove the turret during a prior Navy mission. The armor-belt was much larger than I imagined, coming several feet off the sand and fifty feet in length. We then swam against the current to the bow of the Monitor to look for the mooring line from the previous year?s expedition. We finally found it with some milk crates attached to a big tractor tire about fifteen feet off the port bow. Our plan was a twenty-five minute bottom time with a ninety minute run time. Unfortunately, the mooring line was tangled throughout the wreck, and snarled into a large mass back to the armor-belt where we had first been. After twenty long minutes of untangling and freeing the line, Bob tied on the lift-bag and shot it to the surface. We had now been on the bottom for thirty minutes and were forced to use our longer contingency table. This meant we needed to do almost ninety minutes of decompression with almost a two-hour run time. The current was quite strong on the bottom, which meant it was going to be stronger as we got closer to the surface. By the time I ascended to my forty-foot stop, I deployed my jon-line and clipped off. The water was stunningly beautiful, but it was much darker than when we started the dive. As I looked up I noticed the wave action; I could tell our surface support was not having a very good day above us due to the increased wave height and strong wind. I had only completed half of my decompression when I looked up and saw rain pouring down onto the surface. By the time I arrived to the twenty-foot stop I could see the OC Diver clearly doing thirty degree rolls inside the troughs of the waves. You could almost see the crew looking over the side down on us. I felt very fortunate that I was down here instead of on the boat. As we climbed back aboard, the wind picked up to gale force strength and the rain pelted us from all sides. We tied two large mooring balls to the line and decided to just leave the lift bag there for the time being. Our mission complete, the OC Diver finally headed back home with the storm at her back. When we returned to the marina, the rain had stopped, the wind had died down and the skies almost looked blue, but looks can be deceiving. After dinner we went online to investigate NOAA?s weather buoy located near the Monitor site. The storm front was going to build over a three-day period. With a poor weather forecast we decided we would cancel diving operations for Monday. Tuesday appeared to be another nice day, the storm front had subsided and we were going to make another attempt. Our team?s first priority was to get the REMUS into the water; if we could just get it to fly its mission we felt like we would have time to do more first-hand investigating on the Monitor as divers. We deployed the AUV transponders; and quickly saw that the current was just too strong. These transponders are how REMUS understands where it is in relation to the target so it can complete its 3D mapping mission. The combined weight of the mushroom anchors and extra lead were not enough to keep the transponders in a fixed position, a requirement for accurate mapping. With the transponders dragging across the ocean floor, the REMUS mission was scrubbed. Between the current and the weather taking another turn for the worse, we reluctantly decided to cancel diving operations for the day. Though we were all disappointed, we knew it was the right decision to keep the team safe. Wednesday, Day 4: Once again we loaded REMUS and our dive gear, and then headed out. The sun was blasting down on us and there was just a light breeze. As we motored out, all of us had high anticipation and wondered if today was going to be the day we got to dive the Monitor. Shortly after getting out of the channel and into the open ocean we decided to do a test run with the REMUS. The transponders were deployed and once again we could see that they were going to bounce across the bottom with the strong current of the Gulf Stream. After recovering the transponders, we decide to go on to the site and just see what the weather might be like. We radioed Captain Art Kirchner of the Margie II to advise the other dive team of our plans. Though all of us were afraid to get our hopes up too high, we were at least encouraged about the thought of going back to the wreck. When we arrived it seemed relatively calm, only a slight breeze and very small waves. Ted motored up current from the target to check the speed of the current; it was 1.45 knots. It took about an hour for us to get the boat ready and the deco stations set up. The plan was for Dan, Bob and me to do our dive, check the integrity of where the mooring line was chained to the tire, take video and stills, then shoot a bag; the signal that it was okay for the Margie II to send divers down. Descending to the wreck I had made the mistake of not attaching my underwater camera to a leash. I chose not to do this in order to protect the large dome port of the wide angle lens. As I inched hand-over-hand down the traverse line going against the current it became increasingly difficult to both pull myself forward and hang onto my camera. Ten minutes later I finally reached the down line at 100 fsw and began to relax again, and catch my breath. Fifteen minutes going into the dive we finally had reached the bottom. The dive seemed somewhat surreal, marine life passing by me in slow motion, the wreck a peaceful and quite setting, jacks darting about and sand tiger sharks wondering why we were there. The water was a beautiful blue, visibility was awesome, over 100 feet, and the water temperature a very comfortable 70 degrees. I began moving from the bow to the captain?s quarters. Jeff Johnston of NOAA advised us to look for a PVC pipe that had sampling equipment in it. I really wanted to find this and take a picture of it. I knew the clock was ticking and couldn?t find it so I decided to move further aft clicking as many pictures of the bottom of the wreck as I could. As I worked with the current amidships and then over the boilers and the engine frames I realized that my dive time was now twenty one minutes so I decided to start my slow swim against the current on the bottom on top of the port armor belt. As I swam forward I noticed Bob heading back to the mooring line. Dan had been shooting the port hull structure where the cement bags had been placed to support the hull structure from collapsing. As I returned to the bow Dan swam up over the armor belt and then over the anchor compartment videoing everything for later analysis. As I swam to the ascent line Dan swam past me and went off to the other tractor tire lying in the sand. There was another tractor tire used as an old mooring an additional 30 feet from the port bow. He turned, and then it was apparent to me what he was doing. He was trying to get the whole wreck into the frame. He glided quickly back to the mooring line and we both began our long ascent back to the surface. Arriving at the first traverse-line at one hundred feet, I noticed Mel and Judd climbing down the mooring line. As I made my way towards the rear of the traverse line I realized my camera was going to be a liability as the current had picked up considerably since the start of the dive. With one hand on my camera, and the other on the deco line, I had to figure out how I could free up my hands to relax. I could not release my grasp of the deco line for fear of winding up in the shipping lanes. Finally, I decided to use the double-ender on my primary reel to attach a length of rope I had in my leg-pocket. Then I could attach my camera housing to the jon-line I was previously using. It worked, though my big YS-350 strobes blew-over to one side of the system, knocking against my body. The camera was protected and the strobes trailed behind it, enabling me to free my hands and relax during my remaining hour of decompression. As I ascended to my twenty-foot stop, I noticed more divers beginning their descent. One of them was having trouble going down and decided to take the traverse line to go back up the deco line, aborting their dive. The current made this a very challenging dive, but at the same time, very gratifying. Thursday, Day 5: We make another attempt only to find the current was now 2 to 2.5 knots. The two mooring balls were completely submerged below the surface, with no hope of popping to the surface. We radioed the other boat and advised them to change direction to an alternative wreck site. Since we were already there, we decided to jump in to cool off and maybe get some video footage while free diving near the NOAA weather buoy. Friday, Day 6: This was our last day of diving operations. Reluctantly, we decided the weather is just too rough for the Monitor and make plans to go to another site, giving REMUS a chance to strut its stuff. When we arrive at the wreck we find a local charter boat, which we had radioed with our intentions as he passed us on our way out, tied into the wreck. We cannot safely conduct a REMUS mission with divers in the water, so we disclosed to him that we are going to a new secret NOAA target instead. The explorer Bradford Washburn once told me that to go to the top of Mt. McKinley, or even Mt. Everest is a picnic, even a walk in the park, as long as the weather cooperates. It is the judgment of the explorer and his experience that keeps him alive. The lack of experience combined with the lack of good judgment is what gets people into trouble and ultimately a situation that they can?t overcome. I feel very fortunate to be associated with such an experienced team of people that showed good judgment and put the safety of the divers as its top priority. Dan, Rick, captains Ted and Art, safety divers John Billings and Karle Smith, and the rest of the team made this trip successful and fun. As a team, we only did one dive on the Monitor, but it was a great dive. No one got hurt and we produced a lot of video and stills for NOAA to utilize in their assessments and for future site management. As for Rick, a new dad to a baby boy named Jack, he?ll be back next year. After all, the wreck won?t be going anywhere, and NOAA assured us access to the site would continue for divers. Robin Jacoway is a principal of DeepOutdoors, a California-based dive company specializing in equipment and diver and instructor-level training for advanced technical diving, including rebreathers and advanced trimix. Reviews comings up. This time I mean it! Copyright 2008 Erik Dasque and Sam Clemens :: powered by Wordpress and the The Unstandard theme. :: | | 52 queries. 0.813 seconds.